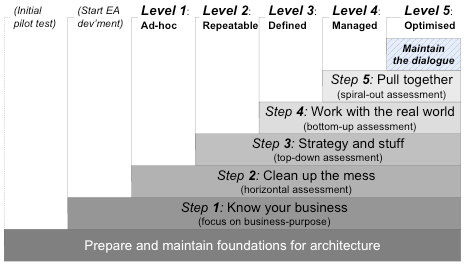 From the outside, the enterprise-architecture discipline – such as it is at present – often looks an absolute shambles: a mess of competing theories and frameworks and self-styled ‘best practices’ that are rarely consistent even within themselves, let alone with anything else. But even if there’s no possibility of a single, coherent ‘The Theory Of Enterprise Architecture’ – and believe me, there isn’t – there is the possibility of a single consistent metatheory, or ‘theory of theory’. That distinction between theory and metatheory is somewhat subtle, but utterly crucial. It turns out that behind apparent order lies an eerie kind of chaos; yet behind that chaos lies an even eerier kind of order. Most people expect theory to be consistent, to deliver a set of rules that make sense in real-world practice, to guide that real-world practice. Which actually is true for most theory in enterprise-architecture. The catch, though, is that each specific theory applies to only to a specific subset of the scope of enterprise-architecture – and often doesn’t work well, if at all, with anything else. Hence the mess – especially if we expect a single consistent theory to cover the entire scope. Each single theory will, at best, only be able to be consistent and descriptive across part of that overall context-space – not all of it. Hence a quest for a single ‘The Theory of Enterprise Architecture’ would not only be futile, but wrong-headed right from the start. By contrast, a metatheory provides a consistent description of the context-space itself – the parameters and trade-offs underlying that context-space, much as above. 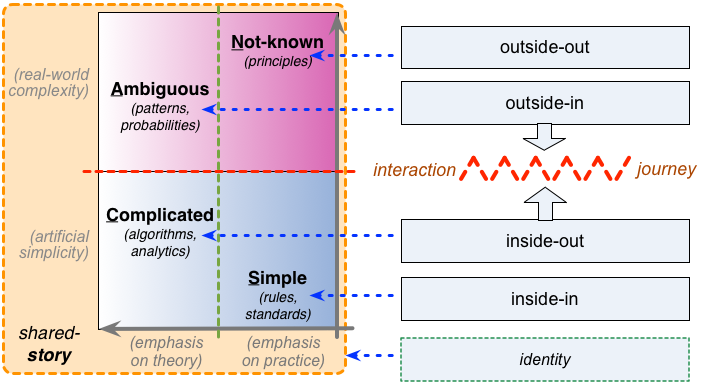 As a theory-of-theory, a metatheory provides a frame in which to identify where each type of theory would work well – and where it wouldn’t. Each of the Tetradian tools or frameworks – such as SCAN, SCORE, Five Element, Enterprise Canvas and the rest – describes a context-space in a different way, and emphasises different types of views and hence different types of theories. In that sense, as someone complained to me a while back, there might not seem to be ‘a single coherent theory of EA’ that links them all together. But what I’ve come to realise over the past few months is that the various ‘hooks’ and crosslinks between each those frames do make it possible to link them all together as ‘a single coherent metatheory of EA‘. Not that seemingly much-desired ‘a single coherent theory of EA’, of course – but probably closer to what we actually need for real-world practice. In effect, it’s another illustration of what I’ve long described as the core-principle and core-purpose for all architectures: that things work better when they work together, on purpose. But here, rather than domains or databases or whatever, it’s the various forms of theory that we need to get to work better by getting them to work together, on purpose. And to do that, we need metatheory and metaframeworks that can bridge across the silos formed by each of those clusters of self-consistent but seemingly-incompatible theory. 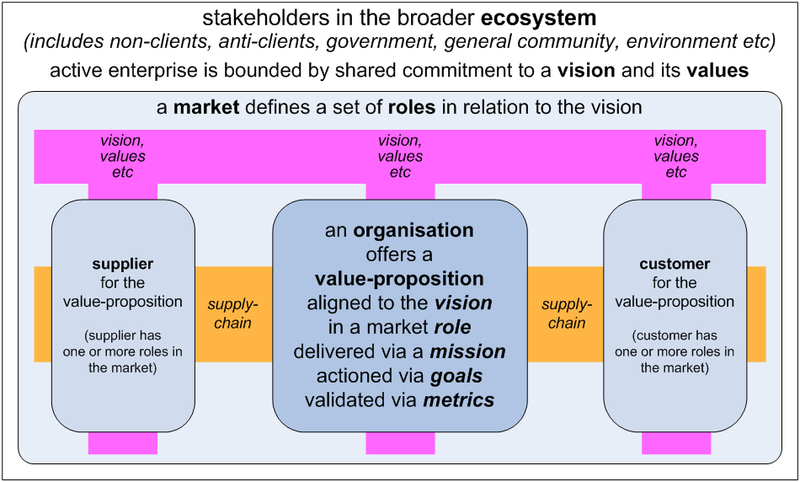 Step 1 (‘Know your business’): There is an underlying human-story – enterprise as ‘a bold endeavour’ – that underpins decision-making and choices for capabilities and services within the enterprise. Step 2 (‘Clean up the mess’): There are clear and identifiable rules that determine clean-up activities such as simplification and de-duplication. Step 3 (‘Strategy and stuff’): Strategic choices – however complicated – can be determined and implemented via algorithms and analytics. 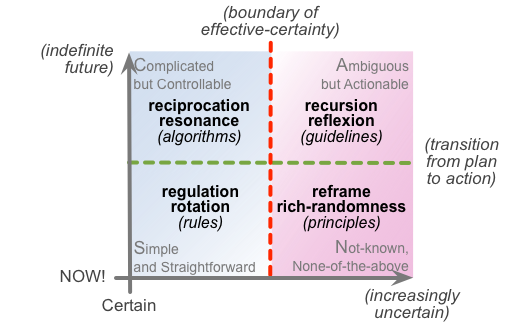 Step 4 (‘Work with the real world’): The real-world is inherently uncertain and ambiguous, but actions can be guided by patterns and probabilities. Step 5 (‘Pull together’): When faced with uniqueness or the not-known, the most useful guidance is provided by principles that anchor back to the original deep-story. The architecture-development is not literally step-by-step in that sequence: step-by-step is what we’d prefer to do, and should do wherever practicable, but Reality Department so often gets in the way towards that ideal! What the model does warn us, though, is that activities for each step in effect depend on completion of the respective parts of the ‘previous’ step(s): hence each time that we do have to do things out of step, we’re creating technical-debt – literal or metaphoric – that we’ll have to come back to and clean up again later. 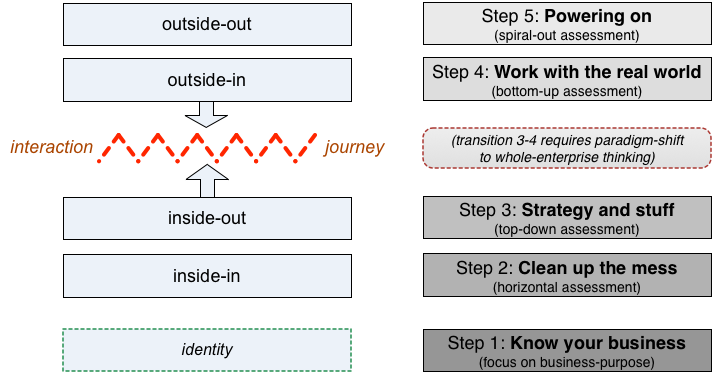 Note that the paradigm-shift that we need in order to transition between maturity-model Step 3 and Step 4 also aligns with – in fact is demanded by – the transition across SCAN’s ‘edge of uncertainty’, or ‘boundary of effective-certainty’. Each of those frames from the Tetradian model-set has its own distinct theory, or more often a theory-set linked together via its own distinct metatheory. 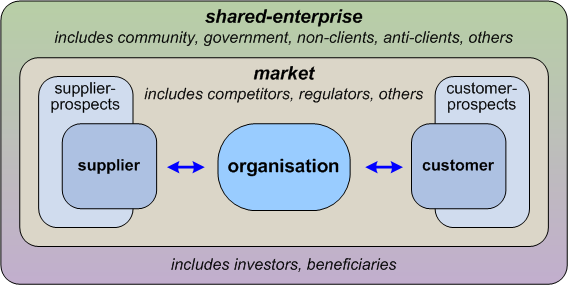 But the connections between the frames – as summarised in visual form above – in turn link each of those theories or theory-sets into one unified, complete, consistent metatheory (or, to be pedantic, metametatheory) of enterprise-architecture and beyond. So no, there isn’t a single ‘The Theory Of Enterprise-Architecture’ – and there can’t be one, ever. 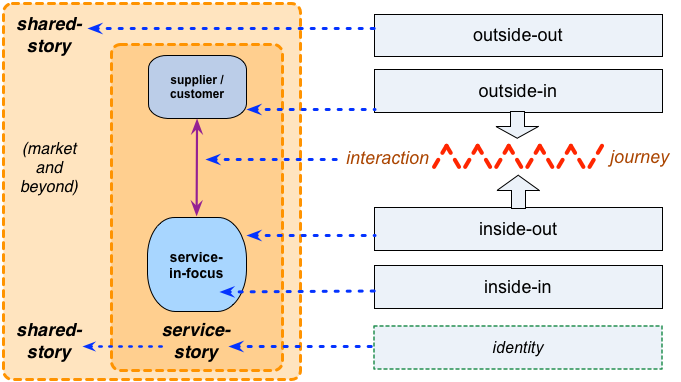 But there can indeed be a single metatheory of enterprise-architecture – and you’re looking at one, right there, in this post. Hope it’s useful to someone, anyway. Over to you for comments, anyone? For the record, the only part of the blog-post above to which that remark could apply is SCAN: and SCAN is not a “teen Cynefin”. Yes, it’s true that to the unobservant or deliberately-ignorant amongst us, there might seem to be some surface similarities, but SCAN has a different theoretical base than Cynefin, is designed for a different purpose, is much richer and more nuanced, and as explained a few years back in the post ‘ Metaframeworks in practice, Part 4: Context-space mapping and SCAN‘, its origins predate Cynefin by at least a decade or more, and is the outcome of a much longer period of study, research and practice. As also explained in that post, it’s true that somewhen back in the past I had made the mistake of thinking that Cynefin could be used for context-space mapping – the purpose for which most of the Tetradian tools are intended. But it became painfully clear, from many different directions, that it couldn’t and shouldn’t be used in that way, and hence I went on to redesign a more usable framework from scratch, with SCAN and the swamp-metaphor and more. A polite request: if people can’t be bothered to read this blog-post above properly, or to read any of the hundred or more other posts here on SCAN and context-space mapping and the like, please don’t come up with snarky putdowns such as “smells like teen Cynefin”? I thought it might be fun to test your theory about theories and meta-theories. 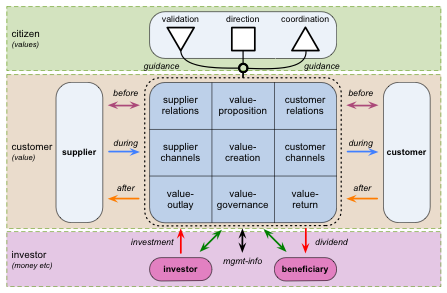 I picked the ‘stratified systems theory’ of Elliott Jacques ( https://en.wikipedia.org/wiki/Elliott_Jaques ) because I have been doing a lot of work with Janne Korhonen, who brought Jacques’ work in Requisite Organization to readers of Journal of Enterprise Architecture not too long ago. I’m thinking this stratified system idea plays into your maturity model, but I’d be interested to hear your take on that. As well, I’d be interested in how Adizes’s maturity model plays into your meta-theory. 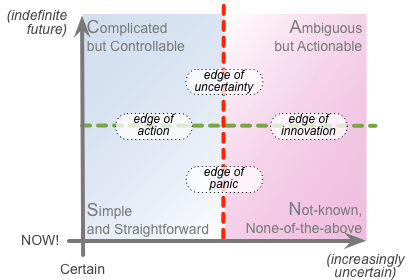 I also wonder whether Sessions’s and Seddon’s suggestions to eliminate or embrace complexity really qualify as theory? Those statements seem more like prescriptions, maybe with some theoretical underpinning of their own? Ah. Oops. As usual, it looks like I’ve gone a long round-about way to describe what is a very simple idea, and ending up probably confusing folks in the process… 🙁 – sorry! In the sense that I’m using here, as ‘theory-for-action’, ‘theory’ is ‘a consistent description of a context that indicates predictions and tests about activities in that [type of] context’. The keywords here are ‘consistent’ and ‘prediction’ – which in turn imply at least some element of prescription, in order to achieve desired outcomes in that context. So in that sense, both Sessions’ and Seddon’s do qualify as ‘theory’: they are each descriptive, each internally consistent, and each predictive about what will happen in a context if the theory is applied. But as theory (or, at least, that form of theory) they have no means within themselves to assess their own validity for any given context – their applicability or appropriateness for use in that context. And the tests embedded in the theory are themselves embedded in and built upon the assumptions of that theory – which gives us an immediate risk of circular-reasoning and similar errors. That’s what can lead us, for example, straight into the trap of ‘policy-based evidence‘. Metatheory is ‘theory of theory’, or ‘theory applied to theory’ – a theory of applicability of theories. We use metatheory to help us select and test which type of theory to use within a context. Metametatheory is a theory of metatheory, which we can use to cross-check the validity of the choices made via a metatheory. And so on… we could go down that rabbit-hole to any depth we might like, but in practice it’s probably best to stop there for now! 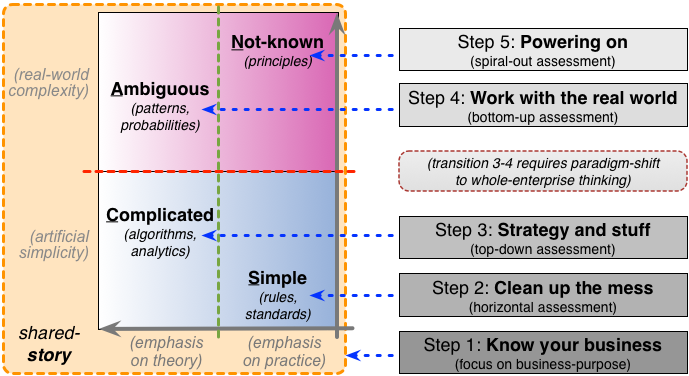 But from what I know of Adizes (which I’ll admit isn’t all that much), his lifecycle model is both theory (a prediction about the progression of organisations) and metatheory (different theory-types – and hence recommended-actions – apply in different stages of the lifecycle). However, there doesn’t seem to be any metametatheory there: the lifecycle is assumed to apply to all organisations, without any built-in tests as to whether the lifecycle-model is valid in any given context. Hence, again, a risk of circular-reasoning and the ‘policy-based evidence’ trap. Avoiding those traps is really what all of this rambling about theory and metatheory is all about. Hope that makes (more) sense now? Actually that DOES help me understand what you are trying to say, which actually is not what I thought you were trying to say. Actually, I’m embarrassed to admit that I superimposed my own thought process on what you said. What I’m interested in is metatheory that applies to many theories, such as Seddon, Graves, Jaques, Adizes, Goldratt (Theory of Constraints), Giddens (structuration theory), Taylor (scientific management), Snowden, von Bertalanffy, Beer, Checkland, Zachman, Chomsky, Sowa, Wittgenstein, etc., etc. Some comment on a few statements from the post. The ambivalence is a norm in social systems. Regarding it as “weird”, or assuming ambivalence and paradox as being a result of an error or being just exceptional, is risky in any attempt to understand what’s going on. I doubt it. It is quite clear that a theory can be either consistent or complete, or at least I’m not aware of a convincing refutation of Gödel’s incompleteness theorems. Having in mind that a meta-theory is a theory, I would need more convincing to even start considering the “possibility of a single consistent metatheory”. 1. What I’m missing in your proposal, are the theoretician and the “users” of the theory. They seem to me excluded, or at least not included in the process of doing what they do, including, developing and/or applying this theory. 2. Any theory is expressed in some language. Shouldn’t then a meta-theory be a theory about language? In fact Doug mentioned some people that worked on that, some of them quite convincingly for me (Wittgenstein), and others not so (Chomsky). Anyway, how do you see the role of an EA meta-theory in general, or your proposal in particular, in the life of an Enterprise Architect? Yes, of course. The point above about ‘lies-to-children’ likewise applies; also note that very careful use of “a single metatheory” (indefinite-article) rather than a purported “the single metatheory” (definite-article). Good point. It’s there, in implicit form – such as, for example, that “a metatheory provides a frame in which to identify where each type of theory would work well – and where it wouldn’t” does imply someone who needs to identify types of theory for a given context. But you’re right, it isn’t there explicitly. My bad, I suppose – but is something that I really do need to say explicitly, every time? Agreed; and agreed that Maturana’s view is one useful example – but one amongst many. In a mainstream scientific/technology context, many would argue that the role of a theory is to provide prediction – which is fine for those contexts that fit well with linear-paradigm concepts, and not so good for high-uniqueness or emergence or the like. Given that EA and similar fields tend to incorporate both some of the former – contexts where linear-paradigm may be valid – and a lot of the latter – high-uniqueness, emergence, etc – then the idea that theory is ‘all about prediction’ can be a bit misleading. Hence I view the role of theory – and particularly of metatheory – as a means to point towards potentially-useful insights: technology (usefulness-oriented) more than science (‘truth’-oriented). Hence the nature of this post, and the type of theory/metatheory described within it. Also the theoretical-base/focus is around relationships between frameworks, rather than purported predictions or ‘proofs’ of a framework: that point should perhaps be emphasised a bit more than I’ve done so above? Probably the main hope is that it might reduce the ‘framework wars’ – that the arguments shift from ‘which one is The One True Framework that applies the everything’, to ‘which frameworks are useful in these specific types of contexts’ – and also be able to explain why this type of framework would be more/less useful than that one, for that purpose. Hope that makes some degree of sense? Question: Why do Enterprise Architecture? My answer: To solve business problems. Question: If you are not solving business problems, what are you doing? I find it interesting that the word “problem” does not appear on this page. Surely any sort of theory must be predicated on a reason for its existence? Or to put it another way, one test of a theory is if it explains its existence. You’re right, the word ‘problem’ is not there. And yes, in part, that could be construed as a mistake, an important omission. But it’s also because my answer to your question would be slightly different than yours: “We do enterprise-architecture to pre-empt business-problems, wherever practicable”. And almost all of the discussion above – including the nature of theory/metatheory as described above – is about pre-empting problems: such as those that could/would/do arise if we use the wrong type of theory in a given context. So in that sense, yes, it does indeed explain its own existence. See the post ‘ Selling EA – 1: What do EA clients want?‘ for some examples of what I consider to be the kinds of questions that EA would typically address. See the post ‘Selling EA – 3: What and how’ for more on why the classic ‘problem -> solution’ dichotomy doesn’t match up well with what we (need to) do, or how we (need to) do it. In terms of problem-think, one way to think of EA is that it addresses the problem of enterprise entropy. Hopefully to avoid; all too often to remediate. IMHO, a problem can be expressed as a question. If you can’t express it as a question then it’s not a problem. Value (as perceived and determined by the business) comes from solving that problem. Not all questions are problems. So fat I think we are in agreement. re “We do enterprise-architecture to pre-empt business-problems, wherever practicable”. I assume you don’t mean that EA is only ever done to avoid problems rather than solve existing problems? I’d agree that it’s one objective but not the only one. And if you phrase it as “how can we use an EA approach to pre-empt potential business problems?” then that’s a question/problem itself. I think we are into semantics here. I avoid such arguments by defining a business question to be a problem, the solution of which delivers value to the business. If there is no value in answering a business question, then why answer it? Which brings us back to the simple statement that “the purpose of EA is to solve business problems”. Or to put it another way, if you don’t understand the problem, any solution will do – just don’t expect it to have value. And getting back to meta theory – you seem to be answering the business question “how do we avoid using the wrong type of theory?”. This has enormous value to the business, because, if you get it wrong there is a high probability of ending up with a failed IT project. And there’s been far too many of them, mostly (IMHO) because the wrong approach (theory) has been used.